Travel with Kevin and Ruth! : Even more visitors! Apparently being only 45 minutes off the Trans Canada highway means that we're a lot more accessible to travelers. We've been here less than two months and we have already received our seventh set of visitors! Doug and Nancy are nearing the end of an epic six month journey around the U.S. and Canada traveling in their VW camper van. They've been reading our blog for quite a while now, and in fact we met them back in May of 2012 in Mexico a couple of winters ago. They're on their way back home to British Columbia, and stopped in here for a couple of nights to say hi. Ruth and I went into town to do a grocery shop yesterday. It'll probably be the last one we do together for a while as our busy camper season begins tomorrow. Quite a few storm clouds around, and it actually poured on us for a while in town. The little blue car, heading back to the park. We arrived back at the park and Doug and Nancy were already there. Funny enough, we had actually spotted each other while we were in town, but we were each busy doing our own errands and decided to make our own ways out to the park. We've been reading each other's blogs so we already know what each other has been up to, but there's still lots to talk about. Had dinner together and then went for a walk around the park. Nice evening, but with all the rain we've had the mosquitoes are back out. The water is still rising. Ruth spotted our young great horned owl! A lot of folks only think of the prairies as being flat but really, it's all about the sky. Ever changing, and vast. 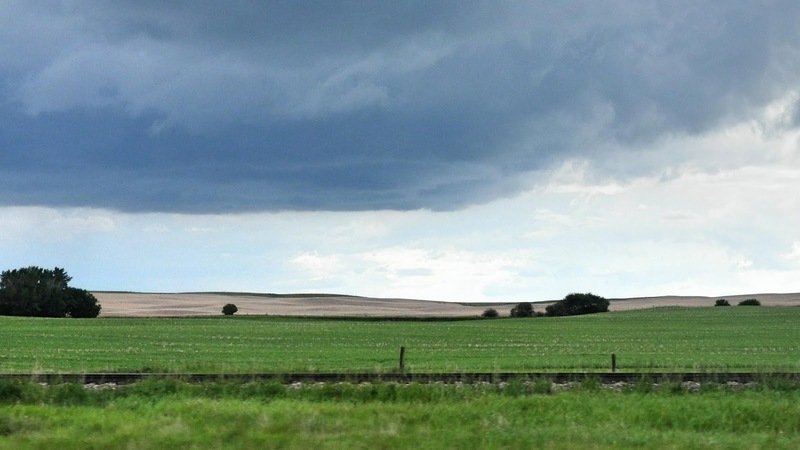 Saskatchewan's motto is "The Land of the Living Sky" and that is certainly the best motto for this province. I'm envious and would love to be sitting there right now with my Mexico friends - you and Ruth, Doug and Nancy. I've been so busy feeling great and having fun with my family I've not posted for a while; I'll get back to it and will read earlier posts of yours and the Doug and Nancy adventures too. I'm cooking up some travel plans for the Fall and Winter and will be writing about it and maybe asking some advice about couch surfing / Servas, etc. Say 'hey' to the Bs and Ruth. Hugs to you all. Wish you could have been here too Mary-Pat but there will always be other times. You know you are always welcome! Feel free to email us any of your questions, we are more than happy to try and answer them for you. Looking forward to seeing what your plans will be for the fall and winter. The location makes you much more accessible. That's what we look for when on the move, not too far off our route. Rv'ers always have lots to talk about too. Yes, we do realize that this location isn't that far from the Trans Canada highway which makes in fairly easy to get too compared to our location last year in northern Saskatchewan which was way off the beaten path.